JOB VACANCY POSITION - HR ADMIN EXECUTIVE LOCATION - HICOM GLENMARIE, SHAH ALAM SALARY - RM 3500 5 WORKING DAYS JOB RESPONSIBILITIES: - • Manage payroll administration, conduct accurate payroll calculation and processing. • Liaise with government statutory bodies e.g. EPF, SOCSO, Income Tax, HRDF and Immigration. • Provide general support in Administration functions • Monitoring and renewal of work permit for foreign workers • Responsible for medical insurance claims for local and foreign employees • Responsible for SOCSO claim • Any other duties assigned by superior from time to time. JOB REQUIREMENTS: - • Diploma/Degree in Human Resources/Business Studies/Management or equivalent with a minimum 5 years of relevant working experience. • Knowledge in BOSS payroll software is advantageous. • Knowledge of labour law and well versed in various aspects of human resources matters. • Able to work independently with positive attitude, resourceful, good interpersonal and communication skills. 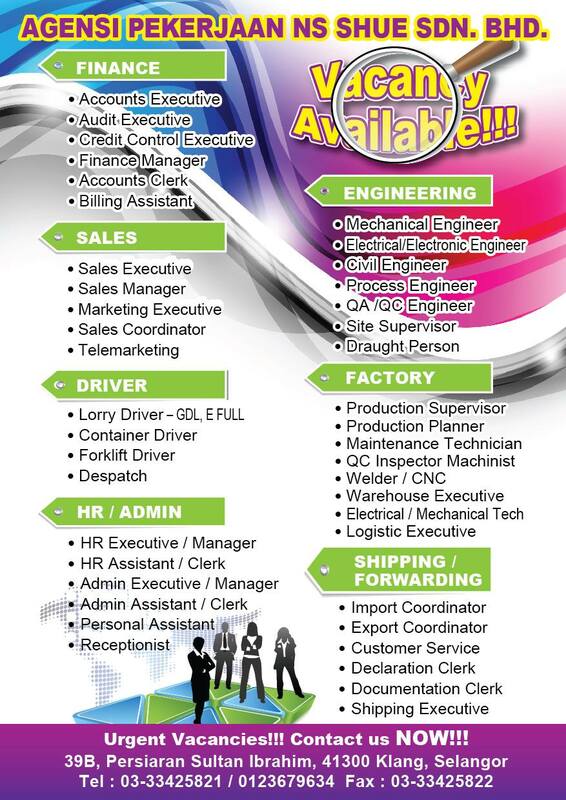 If you have the experience above, kindly email your resume to agensi.sue@gmail.com Regards Agensi Pekerjaan NS Shue.